Wilco everywhere, all the time, 24/7. Great Wilco photos on donewaiting.com by Kim Rottmayer. Nice gallery. "For anyone interested in the process employed by Wilco during the recording of Yankee Hotel Foxtrot, the demos are well worth tracking down. In I Am Trying to Break Your Heart, Sam Jones' documentary on the band, Wilco discuss the creation of something new through structural deconstruction. The numerous versions of 'Kamera' on the Yankee Hotel Foxtrot demos and the More Like the Moon EP show how Wilco embraced this idea. This is a common approach to art in our postmodern, used-up culture, but Wilco employ it so deftly to create pop music that is recognisable in form but sounds completely unique. It also explains why more straightforward songs like 'Alone' and 'Nothing Up My Sleeve' never made it onto the final album. In the form presented on the demos, they could have easily slotted onto Wilco's previous album, Summerteeth." "The Wilco Book is probably one of the bigger surprises I've had this year - what I thought was going to be an overpriced book full of crappy poetry is really neat. Starting off with selections from Bern Porter's Found Poetry, the book seems to have the quality of a Wilco song, and reading the book with the enclosed CD playing feels so undeniably right. And then it moves into different anecdotes from band members about lots of things, featuring interesting pictures and artwork. The humor and good nature of the band shines through the book, and the first anecdote ends with a wonderful illustration of that- says Jeff Tweedy, "I wish we owned the whole building and all lived there, like the Monkees. And had a fire pole from floor to floor. It's not going to happen, though." Wilco curbs rudeness in crowd, then rocks in a review of the Pompano Beach Amphitheatre concert in Palm Beach Post (February 19, 2005) via largehearted boy. NPR's 'All Songs Considered' will present a Wilco Live Webcast. 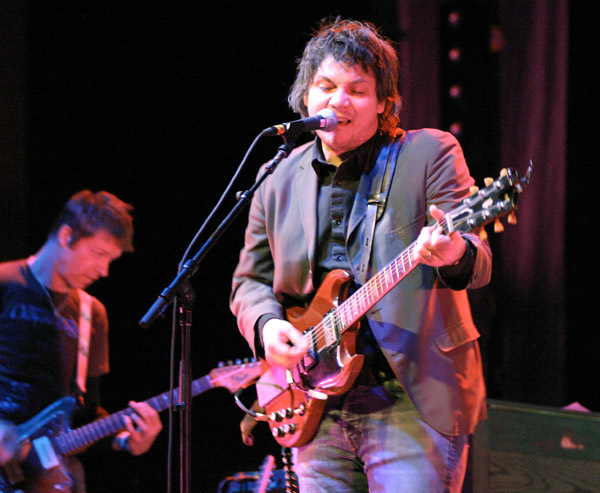 Wilco will be on stage at the 9:30 Club in Washington, D.C., on Thursday, Feb. 24. Thanks via Some Depression.